The Still Traveler | books, adventures, etc. : The Rainbow Rowell read-a-thon continues: Attachments! 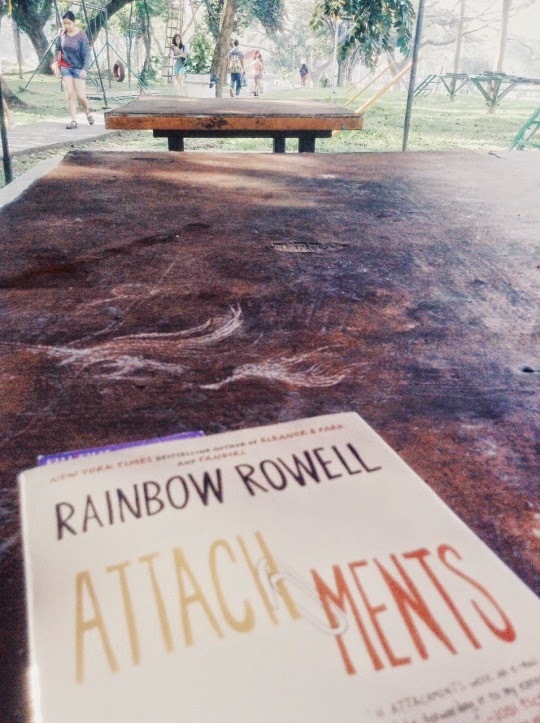 The Rainbow Rowell read-a-thon continues: Attachments! "Do you believe in love at first sight?" "Do you believe in love before that?" I finished this book two weeks ago, and while I know I should have written my writeup on this one after finishing the book because IT WAS SO DAMNED FANTASTIC (That's how fantastic it was, I had to capslock those words), my professors decided we had to start our writing drills. But now that I finally found the time to write, here we go! My copy of Attachments was given to me as a secret-santa Christmas gift from one of my closest friends. It was included in my wishlist for Christmas, a few steps before Eleanor and Park. I wanted to read Eleanor and Park first but since Attachments was already avanilable, I decided to pick it up. At first, I was half ready to give up on this book on the first parts because the establishing part was so long. I didn't really find the need to have an establishing part that took that long. I think it too almost the half of the book before Lincoln actually reacted to him being the cute guy. (But as you can see, I didn't give up on the book.) That's the only con I found about the book. But otherwise, it was finely written. Finely written because I had to stop myself from laughing out loud from the back of a classroom quietly waiting for the professor. At first, Lincoln just enjoyed Beth's emails. It was like that until it was starting to get uncomfortably weird that he enjoys the messages enough to make him fall for her. This is the amazing portrayal of "love before first sight." It really is cool when a guy falls inlove with a girl because of what she says. Also, Lincoln fell in love with her wit and funny remarks. I'm saying uncomfortable because of the shaking he was getting in his life. Somehow, having Beth around seemed to have given his life a bit of a change. Rainbow Rowell's superior skill in developing her characters properly is once again proven in this book. I couldn't put to words how exactly these characters are beautiful and real in different ways but I believe that every single character in this story has a vibrant characteristic, and that all of their characteristics were properly utilized to keep the story interesting and unique just as how its plot is. There may be a few chances for an Attachments love story if compared to a Fangirl love story but just the same, the kind of love story in this novel felt real, and it was special in a way that the boy solely fell in love with what was brought out by the girl's own wit and brains. It hardly happens nowadays that the boy falls in love with a girl after his admiration for her. Happy Valentine's day lovely beings. May books with these kinds of love be the kind of love you meet today.